Pony racing at the local Point to Points is always a high point of my spring. 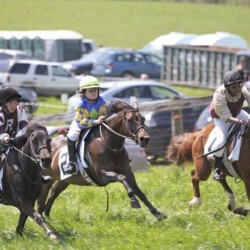 I love to watch the kids before the race when they are gathered in a circle around the steward going over the rules while a sibling, parent or friend walks the pony around the paddock; I love to watch the kids get on their ponies and head off to the start behind the outriders; and mostly I love to watch them run to the finish with an intensity and competitive spirit that transcends their young age. This year at the Plumsted Races the competition was fierce and friendly.